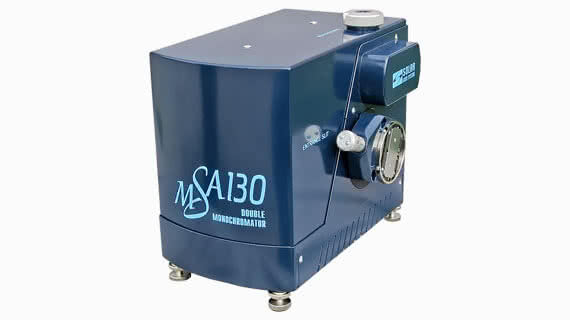 The MSA-130 is a compact double monochromator with enhanced functionality and low stray light. The key feature of the MSA-130 is its unique ability to operate in both dispersion additive and subtractive dispersion modes. 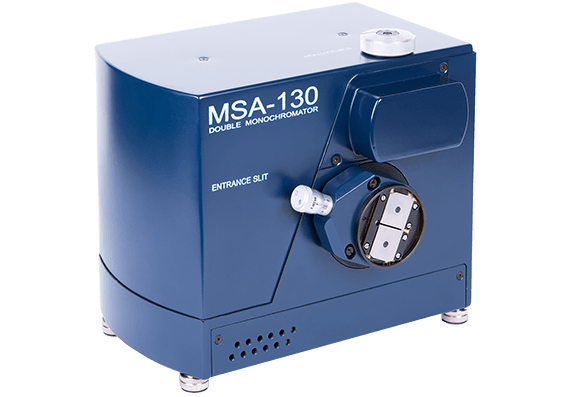 The MSA-130 is a compact double monochromator with enhanced functionality and low stray light. The key feature of the MSA-130 is its unique ability to operate in both dispersion additive and subtractive dispersion modes. The MSA-130 operation modes are changed over by manual switching of a two-position selector switch from the position “Addition” to “Subtraction” and vice versa without any additional alignment by the user. The instrument is multifunctional, compact, easy-to-use and reliable. In the Additive Dispersion Mode MSA-130 operates as a standard double additive monochromator (effective focal length is 260 nm) with extremely low stray light provided by its intermediate slit. In the Subtractive Dispersion Mode MSA-130 operates as a tunable filter with adjustable band pass and sharp edge. A width of selected spectral range is set by the intermediate slit, and the central wavelength is set by synchronous turning of two identical diffraction gratings. 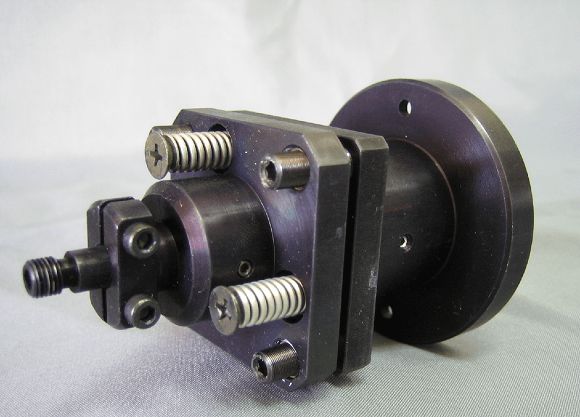 Since in the Subtractive Dispersion mode the beam path in the second half of the double monochromator conforms completely to the reverse beam path in the first half; the result is the full compensation of dispersions, and the zero dispersion is achieved. The whole spectrum selected by the intermediate slit is imaged at the second monochromator’s output as a spatial line. The MSA-130 is equipped with choice of ruled gratings to suit the application. To ensure perfect dispersion compensation (zero dispersion), the manufacturer takes special care that diffraction gratings of both monochromator halves were replicas made of the same matrix. The MSA-130 entrance, intermediate and exit slits have manual control and smooth micrometrical adjustment of the opening width. Entrance and exit slits are placed at an angle of 66° to the vertical. Both the MSA-130 gratings are located at the same axis and are driven by the same step motor. This allows ensuring complete synchronism of gratings’ rotation and high precision of wavelength setting. The MSA-130 gratings are computer controlled via the USB interface. In terms of design, the gratings are fixed in one holder, which is carefully aligned by our service-engineers. The holder with a working set of gratings is installed into the device. At your choice, the MSA-130 may be supplied with one or more additional sets of gratings in holders. Replacement of diffraction gratings in the MSA-130 is easy and fast (see the figure). To replace gratings it is enough to open a cover at the MSA-130 rear panel, unscrew two mounting screws and withdraw the holder with gratings. The holder is placed into a special box from the Spare Parts Kit. A new set of gratings is installed into the MSA-130 housing and fixed with two screws. This procedure is sufficient to perfectly reproduce the position of gratings corresponding to the manufacturer’s calibration. 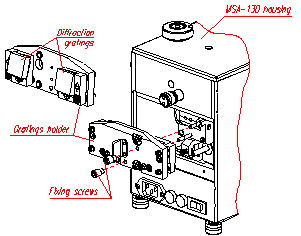 The MSA-130 delivery set includes a viewing unit Sight, which is used to check the current monochromator calibration by the user. The Sight contains an achromatic objective; it is placed on the entrance slit and is used to visually observe positions of the known spectral lines relative to the centre of exit slit. The spectral range of the Sight operation is 200nm-2000nm. The software of the MSA-130 monochromator provides possibility of real-time correction of factory calibration by the user. The software also allows calculating the line width selected by the MSA-130 in the Additive Dispersion and Subtractive Dispersion modes depending on the set width of entrance, intermediate and exit slits. The MSA-130 exit slit contains two mounting holes M2.5 that allow fixing your own detector to the slit housing, if necessary. Two additional holes M3 are located on the housing close to the slit unit. 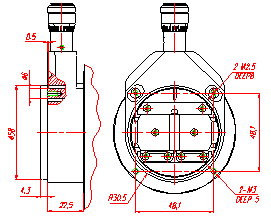 Location of mounting holes is shown in the figure. 1) One pair of gratings is included into the standard delivery set. The 2nd and 3rd pairs may be supplied optionally. Diffraction gratings with parameters other those specified above are also available. 2) The usable wavelength range covers the spectral range where the grating efficiency is more than 30%. 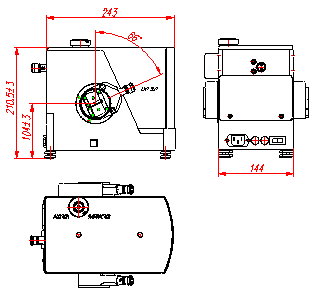 The MSA-130 double monochromator has a wide range of accessories for efficient light collection from the sample located at a finite distance and in infinity, entering light into the monochromator with and without an optical fiber, performing effective aperture matching of the optical fiber and monochromator. 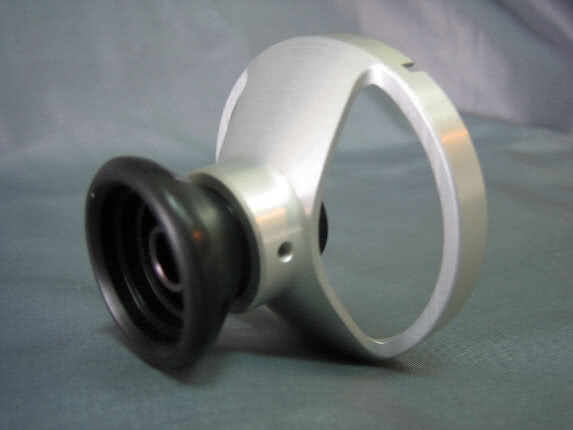 Adapters PS-2 and PS-3 provide the wide-aperture light collection from a sample located at a finite distance and the effective light input into an optical fiber. PS- 2 features high UV-transmittance, while PS-3 has the possibility of installing an Edge filter. The AFA contains two achromatic objectives and the SMA-905 connector. It is mounted on the MSA-130 entrance slit and aimed to match apertures of an optical fiber and the MSA-130 in order to reduce total stray light and optimise light throughput. The spectral range of the AFA operation is 200nm-2000nm. The MSA-130 entrance and exit slits are located at an angle of 66° to the vertical. In case your application requires vertical slit position, the instrument can be equipped with a special support which provides a tilted position of the housing and vertical position of slits. Optionally the instrument can be supplied with a support providing the horizontal position of the MSA-130 slits. Consult a SOLAR LS specialist to select the complete set of the device that best meets the requirements of your instrument complex. 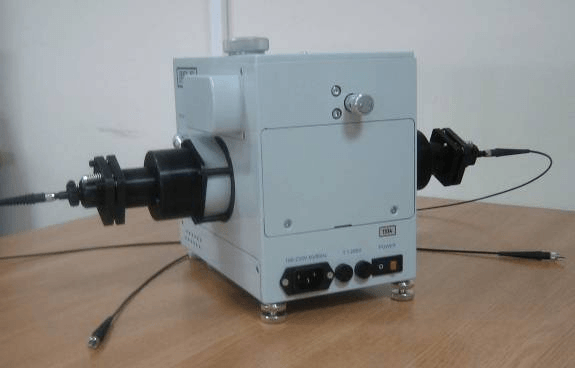 The main advantage of the MSA-130 double monochromator is its multifunctionality, i.e. ability to operate in both Additive Dispersion and Subtractive Dispersion modes without any additional alignment or manual replacement of optical elements. This unique feature was implemented by introducing into the double monochromator schematic of a changeover mirror system aimed for optical matching of two single monochromators (see «Mode switch» in fig. 1 and 2). In the Subtractive Dispersion mode the monochromators are matched with the use of two flat mirrors, with an intermediate slit between them. When the MSA-130 is switched to the Additive Dispersion mode, one of these flat mirrors is interchanged by a roof mirror, i.e. a reflector made of two mirrors that form an angle of 90°. Mode switching is achieved by a simple turn of the two-position Mode Switch within the same monochromator design. Thus, the MSA-130 ensures operating multifunctionality, while being compact, rigid and stable. All the optical elements in the MSA-130 are carefully aligned by the manufacturer and do not require any additional re-alignments either at switching the operation modes, or at replacement of gratings’ set. *The MSA-130 optical bench is patented.